The acute deterioration in Israel's environmental condition is only part of the social agenda that brought one million Israelis to demonstrations this past summer. Are we seeing a change in the Israeli political map and the public's ecological awareness? What policies are needed to address the steady damage to Israel's open spaces, biodiversity loss and the disappearing Dead Sea? 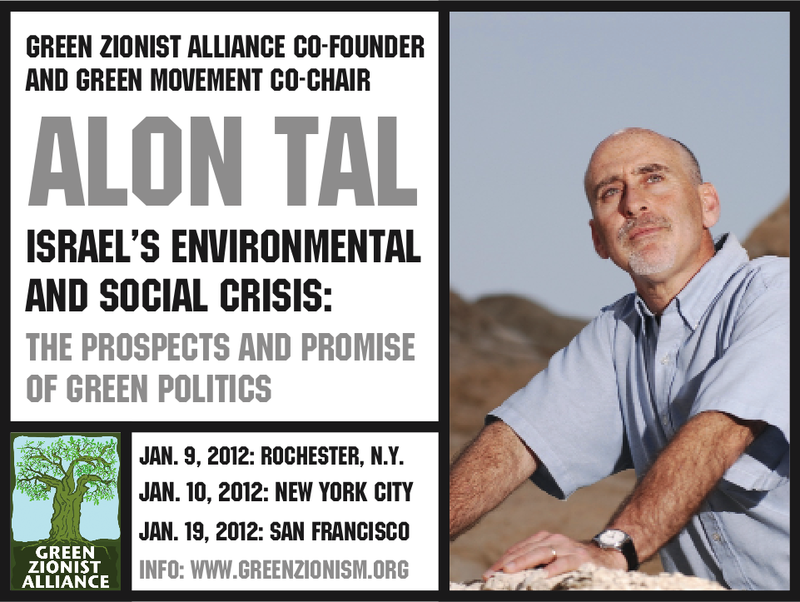 Green Zionist Alliance Co-Founder and Green Movement Co-Chair Dr. Alon Tal, recognized by Haaretz as Israel's leading environmentalist, will present a new green agenda for Zionism and consider scenarios for progress in Israel. Click here for more information about hearing Alon speak in Rochester on Jan. 9, 2012. Click here to register for the free event in New York City on Jan. 10, 2012. Click here for more information about hearing Alon speak in San Francisco on Jan. 19, 2012.